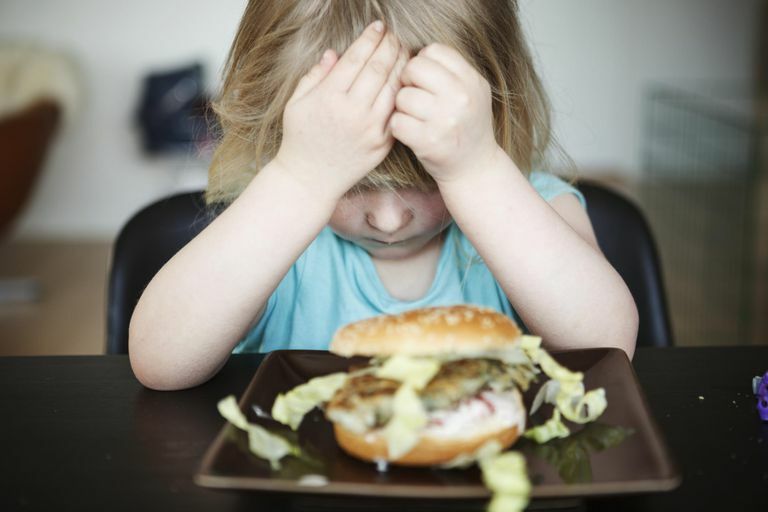 It is not at all unusual for kids to be picky eaters and that picky eating can be quite frustrating for parents who are concerned about their children's eating habits. However, children aren't being picky just to annoy their parents. There are legitimate reasons for picky eating and understanding those reasons can help us find ways to get our children to eat more foods that are good for them. Children are picky eaters for two main reasons: they prefer sweet over bitter tastes and they are afraid to try new foods (neophobia). Science suggests that both reasons are rooted in survival. Dislike of bitter foods is a defense mechanism to protect us from eating things that are poisonous. Imagine young prehistoric toddlers picking a berry, leaf or flower from a plant and putting it in their mouths. If they ate it and it was poisonous, they would die. However, they were less likely to eat it because of the aversion to bitter tastes. They would spit it out. Sweet foods, like fruits, on the other hand, are energy-rich foods and it makes sense for children to be naturally attracted to the taste of foods that will give them the most energy. Neophobia is another defense mechanism. It doesn't usually kick in until kids reach about two years old. Interestingly, that's about the age when children, in most societies, are no longer breastfed. That means youngsters aren't completely dependent on their mothers for food. Avoiding unfamiliar foods can actually keep them safe. After all, they have no way of knowing what is and is not safe to eat. A final cause of picky eating is a dislike of particular tastes, smells, and textures of foods. Gifted kids with sensual overexcitability can be especially sensitive to certain tastes and textures. They may hate creamy textures or a mix of textures, like something that is both crunchy and creamy. These kids can also be a bit overwhelmed by too many tastes blended together and some of them can distinguish the various herbs and spices in one dish. Once you understand the source or sources of your child's picky eating habits, you'll realize that she is not being difficult or stubborn and you'll be ready to help her broaden her tastes. Sweeten Bitter Vegetables: Sweetening vegetables can be done a number of ways. You can top them with a little mild vinegar, lemon juice or honey, or you can add caramelized onions to them. Many recipes for caramelized onions say to slice the onions, but kids have an easier time with them if the onions are chopped. Serve Vegetables Raw: Most vegetables are sweeter when they are raw, so kids who resist eating vegetables may eat them raw. It's a great way to get kids to eat green vegetables, like peas and green beans. Even potatoes can be eaten raw! Serve Foods in a Favorite Texture Form: Some kids like crunchy foods and some kids like creamy foods. If your child likes crunchy food, raw vegetables are good. If your child likes creamy foods, try a vegetable souffle or you can simply mash them. White potatoes can be mashed, of course, but so can sweet potatoes and even cauliflower. You can even fry vegetables. Instead of french fried potatoes, serve french fried green beans or french fried cauliflower. If you don't want to fry the vegetables, try coating them with a little flour, sprinkling them with a little oil and baking them until they are crisp. Link Foods to Your Child's Interests: This takes a little creativity, but it works well with younger kids. When my son was little, he was a very, very picky eater. I tried almost everything to get him to get something other than milk, fruit, and bread. One day I saw chicken tenders shaped like dinosaurs. My son loved dinosaurs so I thought he'd like them, even though he didn't like chicken. I was right. He had not been willing to try eating chicken before, but when he saw the dinosaur shapes, he was more than willing! After that, I offered foods, including vegetables, in some way connected to dinosaurs. Carrots, for example, were dinosaur food. You may not get your child to like foods, but you might get her to try them. Respect Your Child's Tastes: Everyone has foods they like and dislike. If your children don't want to eat broccoli, then don't force it. You certainly want to encourage your child to try a variety of foods, but if your child has tried something and says she doesn't like it, then respect her decision to say "no" to eating it. Keep serving that food at mealtime. Over time, your child may become more willing to try it again.